As you know, after 25 years Oprah is saying good-bye to The Oprah Show. I've watched the show off and on for years, perhaps more so in 2011. For many, 2011 was a sentimental journey in rapidly changing times. 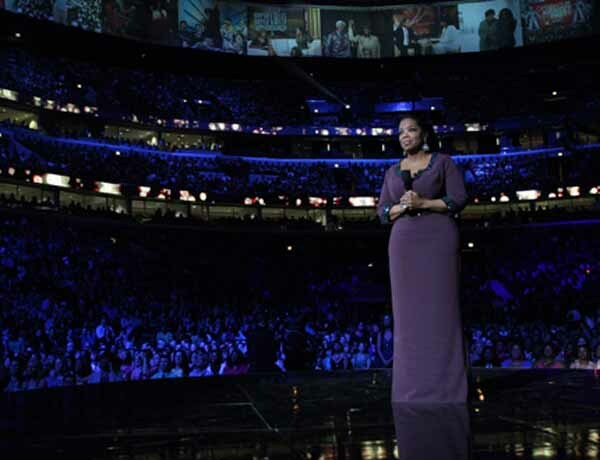 The final segments of The Oprah Show featured endless entertainers, loving friends, and viewers who came to say good-bye. Where were you 25 years ago? How have you grown? I was divorced, living in Manhattan Beach Brooklyn, my daughters were almost grown, and had begun the part of my journey shown to me in 1954 that would bring me to where I am today. Clients always ask me what they can do to make a difference in the world. - not on a small scale, as time is moving too fast now - but on a grand scale - something linked to the shift of human consciousness as the program closes. Are you one of those people? It seems to be all that matters to everyone - as if they are programmed to do something at the end. I tell those clients that the key players on the world stage, who are here to make a universal difference, have all been in place for years, as if that was their destinies, and they have lived them. They are the Real People - not those ego driven - who have worked tirelessly to enlightened the world for decades. When mentioning who they are, I always start with Oprah. In 1986, the doors to new worlds were about to open throughout the program, attracting people based on grid alignment for experience ...... accelerating till the end of time. We would all grow and become very different people because of Oprah and through our own tireless efforts to help ourselves and others. A sweeping feeling of nostalgia came over me as I watched the final shows. One though came to mind ... closure is here ... not only for Oprah, but for the end of time spent in this program, learning, growing and now returning to who we are. For some the journey started decades ago, for others, more recently, with a need to hurry as something internal is saying, "Time is short." Each day we read about the madness in the world mixed with lots of love and light and a feeling of all things being connected and going somewhere ... home. The series finale of The Event Monday night - was about rebirth. In the final moments, Leila, who is half human, half alien, announces her pregnancy (shades of Taken). As the alien planet comes through the portal, Christina Martinez, the First Lady, stands with her young son who asks, "What it is?" She answers, "Home." This is all that remains. We are all going home, not another Earth, back to light and consciousness.